Howard Zinn died today. What a shame — I was just speaking to a student this week about how great he is. I'm way too exhausted to write something properly, but here's part one of a lecture he gave recently so those of you who don't know him can get a taste. I can't explain precisely why, but there's something beautiful and ethereal about this video. The guy is providing a sign-language transcript of Suzanne Vega's song "Tom's Diner". Perhaps it's the zen-like lack of expression as he waits for the lyrics. Perhaps it's the combination of fluid music and fluid hand motions. Perhaps it's the intriguing connection of certain American Sign Language movements to the actions themselves. Anyway, I was flipping through The YouTube today and sat enthralled. Enjoy! Check out the cool new wallpaper I made. If you don't get it, you should learn more about Magritte's work. 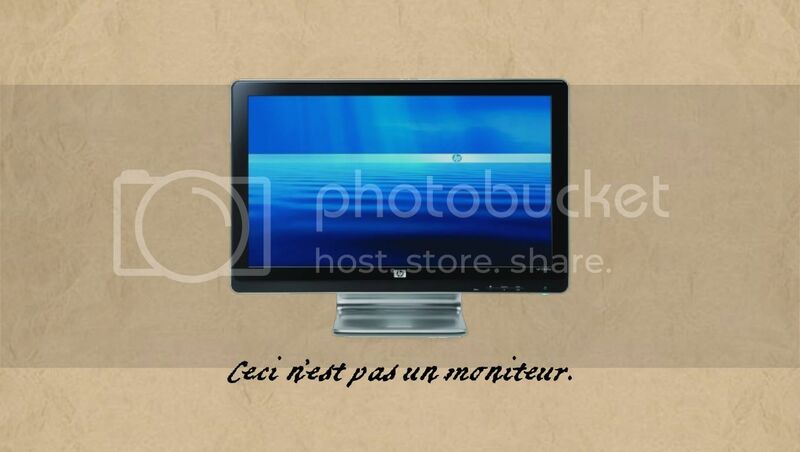 For best results, replace the HP2009m with an image of your own monitor. Today I'm listening to: The Big Lebowski! Whatever you may think about Sarah Palin, whatever you may like or dislike about her personality, whatever you may believe about her life story or her husband or children, whatever you may think of her political ideology, the truth is this: On at least one very important point (representative of many other points), she is very, very wrong. These posts had an impact, and it made me think, Isn't Facebook a terrific illustration of the power of American ingenuity? Facebook was created in a Harvard dorm room in 2004. No one gave its young creator a government grant — he just did it on his own, like generations of other American entrepreneurs. However, the Internet — without which there could be no Facebook — was in part the result of a massive government project. The US Defense Advanced Research Projects Agency (DARPA), in coordination with computer science departments at universities around the country (and researchers in other countries) spent millions and millions of dollars to develop the amazing technology that allowed Mr. Zuckerberg to make his ugly-chicks/farm-animal site. Sarah Palin complaining on Facebook about how reliant we all are on big government is criminally pathetic. If she doesn't know, then shame on her for being ignorant. If she knows and is trying to deceive her readers, then shame on her for hiding the truth. Pic from SarahCalendar.com. 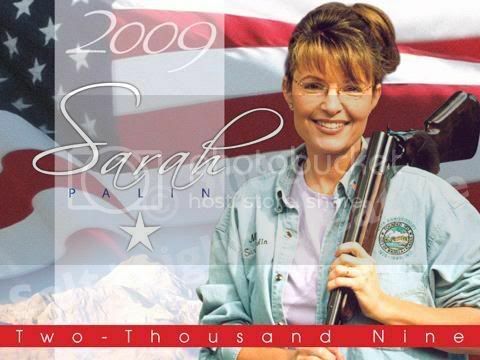 Just $15.95 — order now to get "Over 50 photographs of Gov Sarah Palin and her family". But don't talk about the kids! It's awesome, it's got great music. Very meta. Thanks as always to Madsimian. Today I'm listening to: SomaFM!